Nike SB sets forth a special Dunk High inspired by the Air Jordan 5 “Black Grape” colorway that released last year. 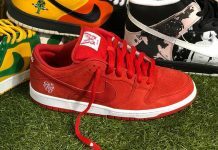 We’ve all seen the Air Jordan inspired Dunk Lows pre Nike Sportswear and the Air Jordan 1 High x Nike SB collab in recent years. Now, Nike SB sets forth an Air Jordan 5 Retro inspired SB for the Summer time. 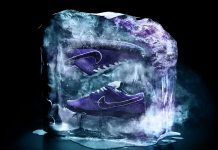 Inspired by the Air Jordan 5 “Black Grape”, this Nike SB Dunk High features everything the Air Jordan 5 Retro does including it’s translucent side panels, Colorway and suede. 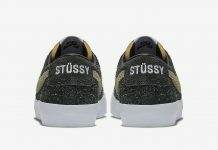 These will surely make a good addition to your Air Jordan SB collection so stay tuned with Modern Notoriety for a release date.